Four days of intensive discussions, seminars and evening dance performances marked the celebration of the 30th anniversary of the Beijing Dance Academy’s Department of Dance Studies. The event kicked off early on Monday 17 November with an address by the President of the BDA, Guo Lei, which was followed by a two-day conference and two-and-a half days’ teaching by international dance academics. Alongside members of the Beijing Dance Academy and the visiting academics (including us London lecturers and our collaborative partners from the Taipei National University of the Arts), a handful of scholars from other Chinese universities contributed to the proceedings. The first two days were filled with panels of short (10-minute) presentations on a range of topics, dedicated to the development of Dance Studies as a discipline (Day 1) and Chinese Minzu dance (Day 2), with Q&A sessions wrapping up each panel. The first day explored how Dance Studies has evolved as a subject in its own right and produced a body of theory to complement the practice of dance. 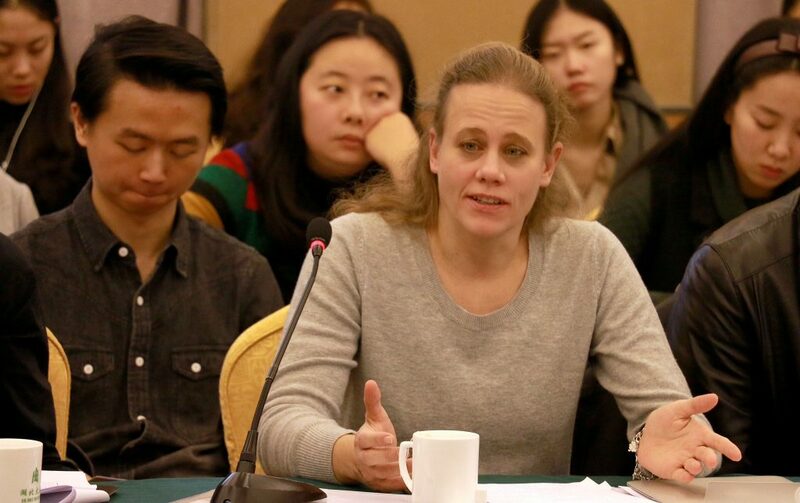 Discussions throughout the day allowed for interesting insights into the ways in which dance is taught in China – and at the BDA in particular – as well as useful comparisons between tertiary-level dance pedagogy in China and the UK. One topic that stood out to me, and was raised several times throughout the conference, was the relevance of dance and its theoretical study to the wider Chinese public. How can this be achieved? In Western academia, there are several ways in which greater societal impact has been promoted. For instance, funding bodies such as the British AHRC require scholars to demonstrate that their research or practice has impact on broader sections of the population, for instance through the dissemination of findings in publicly-accessible museums or performance workshops. In New Zealand – where I previously worked – academics were expected not only to achieve high standards of research and teaching, but also what was called ‘service to the community’: something I fulfilled by offering evening dance classes for members of the public (while others volunteered, for instance, to act as judges in local dance competitions). In China the question is particularly significant, as dance is being forced to redefine its position in society after having lost the centrality it enjoyed within Mao’s political culture. While in some ways it is becoming a more privatized venture during a period of rapid globalization, dance still fulfills important social functions with many parks and public squares being filled with individuals busying themselves with all types of it – from traditional Chinese forms to Western-style ballroom dance. If I recall correctly, one issue that was touched on repeatedly at the conference was how to create connections between these everyday practitioners (who are normally amateurs) and professional institutions such as BDA. The Western academics focused on dance studies as a field of enquiry in their respective countries, mostly in the Anglo-American world. My own contribution addressed issues such as the founding of the first dance programme in the United States and the variation in the discipline between countries, while Vida Midgelow examined in detail the current UK climate and in particular the notion of practice-as-research. A highlight of the day was a t’ai chi encounter between my colleague Steffi Sachsenmaier and a staff member from the BDA. I found it especially refreshing to witness the diversity of opinions among the BDA staff; some discussions were indeed quite heated and revealed significant differences of opinion, for instance over whether scholars should research choreographers affiliated with their own institutions or from further afield. 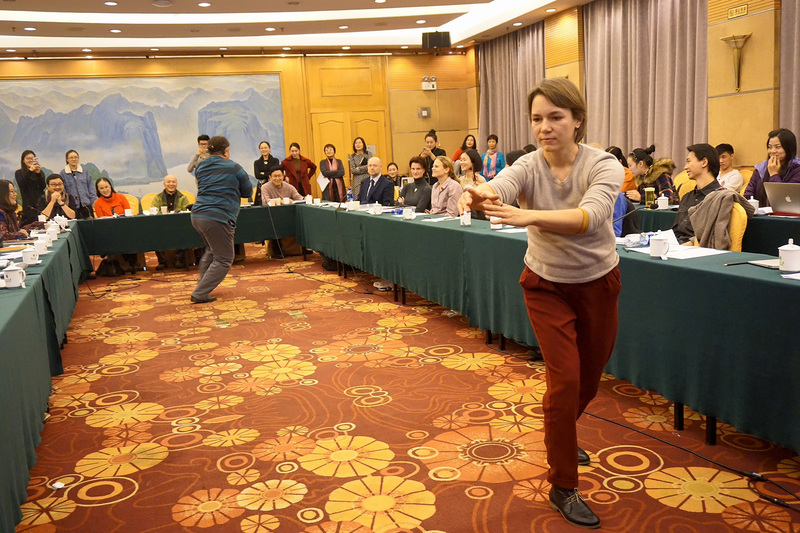 In contrast to the first conference day, the second was more concerned with actual dance practice, and incorporated intriguing samples of various Chinese dance styles, including those of the Han ethnicity, a sword dance and a fan dance performed by students. After a day of theorising, this came as a welcome contrast. Questions arising included how to perform Chinese and classical and folk dances in a 21st century context, and whether and how they should be adapted. Such issues are interesting in the context of the Western academy where folk dance exists (if at all) at the fringes of vocational training. The last two days of our stay were dedicated to teaching 90-minute seminars to undergraduate students from the BDA. The choice of subjects were entirely up to us, and it was a challenge to select topics that first-year students who were not yet acquainted with Western theatre dance would be able to follow and benefit from. I presented a historically-oriented class on German modern dance; traversing questions of the technique, music and underlying philosophical principles of artists such as Rudolf von Laban and Mary Wigman. It was my particular intention to set down the important global influences of German dance, which reached to North America (through Hanya Holm), South America (through Jooss and Leeder), Europe (via Jooss student Pina Bausch and many others) – but also, vitally, to Far East Asia. It is not always recognised that the Chinese dance pioneer and BDA president from 1955, Dai Ailian, trained with Kurt Jooss in the UK; while Wu Xiaobang, another important figure in Chinese dance, received influences from German modern dance through his Japanese teacher Takaya Eguchi. My own seminar fitted in well with two interesting contributions by Taipei academics Yunyu Wang and Ya-Ping Chen, which also addressed themes with a German focus: Yunyu’s presentation, for instance, analysed Laban’s movement principles from both theoretical and practical perspectives. Other talks, such as Martin Welton’s on the theatrical technique of repetition, testified to the sheer breadth of academic treatments of theatre and dance. They also highlighted, however, the different orientations – both in academic and aesthetic terms – of Chinese and Western scholars respectively. For instance, when Chinese students wondered why Western choreographers and theatre directors promote performances that lack technical prowess or beauty, Martin responded that on the contrary he finds works with these attributes less than inspiring. Such differences in aesthetic agendas, which have at their core the divergent trajectories of Chinese and Western dance, certainly warrant further discussion and exchange of perspectives.